The villagers of Loliem-Polem in Canacona are up in arms. They are opposing, it seems, a ‘mega project’. Only in this case, the ‘mega project’ in question is a proposal for a new sprawling 120-acre campus of the Indian Institute of Technology (IIT) to be set up in Goa. Considering that this is a plan for the development of cutting-edge higher education, some people are at a loss to understand the protest. However, given Goa’s history with large-scale projects that gobble up land and other natural resources, one can see why the villagers are anxious about the take-over of so much land. That apart, those who argue for the IIT campus to be set up in order to bring quality educational institutions to Goa may have good intentions, but do not seem to see the larger picture of what education is supposed to do for society. Hence, there is another dimension to the issue, that of social justice in education; one that needs to be considered along with the land issue. Given that IITs have witnessed the emergence of pro-Hindutva lobbies, as well as the recent anti-caste assertion, one would expect that those who bat for the IIT in Goa will take these happenings on board as well. If we ask ourselves what is the most basic function of education, the answer surely would be to enable a person to be gainfully employed due to the skills that he receives after years of schooling and college. Additionally, we can also say that the educational system needs to produce enlightened citizenry. To that end, everyone should have a right to an education. But in recent years, we have witnessed repeated instances of discriminatory practices that precisely undermine this right to education for all. While the issue of the Medium of Instruction (MoI) can be cited as an example of how primary education of young children is sacrificed at the altar of politicking, the unfortunate death of Rohith Vemula at the Hyderabad Central University illustrates how universities and higher educational institutions have a long way to go to secure social justice for the most marginalized of the population. This is why claims of excellence by elite Indian educational institutions need to be taken with a pinch of salt. If we focus closely on the impact that the new IIT will have on Goa, it would seem that the benefits would not accrue to the majority of the locals as easily as one may think. 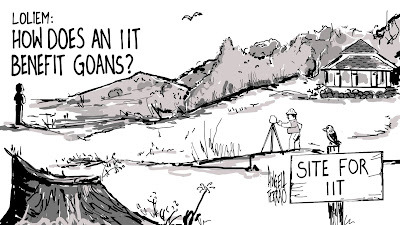 Getting into IITs is not easy. Especially since admissions are done on the basis of the Joint Entrance Exam (JEE) in which lakhs of aspirants try their luck. The preparation for the JEE generally requires specialized ‘coaching’ in private institutes, where the candidates have to pay lakhs of rupees. There was an argument that the new IIT campus in Goa will be a boost for the largely agrarian communities of Loliem-Polem and surrounding areas. However, considering the immense financial capital necessary to prepare for the entrance exam, would the children of such agrarian communities in Loliem-Polem – or for that matter any such communities in Goa – be able to fairly compete? One doesn’t think so. While an IIT may spring up, it is no guarantee of equal opportunity. To add to it, majority of Goan students would be disadvantaged because they do not possess the resources necessary to “crack” the entrance exam. Implementing policies of social justice and inclusiveness has been a problem for all educational institutions in India. The idea that ‘merit’ trumps everything is at the root of discriminatory practices – often relating to caste – in Indian universities. While the universities oriented towards the humanities will at least be mildly embarrassed to peddle the argument of ‘merit’, even if caste-based discrimination goes on unabated, there are many technology institutes in India that still recruit students solely on the basis of ‘merit’. What ultimately this would mean is that if the ratio of a section of students in these elite campuses is low (such as Goan to non-Goan, or lower-caste to upper-caste), then these groups of students can be seen to lack ‘merit’, ‘talent’ or ‘ability’. Activists working on the issue of Dalit students in campuses have highlighted how they are discriminated against for lacking ‘merit’. Speaking specifically of higher education in Goa, one cannot leave out Goa’s only university. For a small place like Goa, a centre of excellence should necessarily be one with a range of courses from the sciences to the humanities and social sciences. An establishment like the Goa University could be better suited, as opposed to an IIT whose focus is largely the sciences and technology. This is not to say that moving away from ‘only technical education’ to a combination of ‘technical-humanities education’ will make all the problems of discrimination, as discussed earlier, go away. Indeed, if the recent news reports and analysis of the manner in which affirmative action is scuttled in Goa University are to be taken note of, then it is indicative that having humanities-based courses does not guarantee a level playing-field. And yet one can make the case that having a range of courses from the sciences and humanities would allow a student access and choice to an all-round curriculum. For if we are interested in bringing quality education and in making sure that the fruits of education reach all students, then our conception of higher education should be broader. The one-sided onus and value that is placed on technical and science-based education should give way to valuing the acquisition of various types of knowledges, even if it seems that such knowledge does not have an immediate market value. Indeed, fostering a community and culture requires that we also promote education in the humanities. Making an argument for Goan students benefitting from centres of excellence set up on Goan soil, does not mean that one is making a ‘Goan v/s outsider’ argument, or that one is trying to suggest that non-Goan students are not welcome. Indeed, educational hubs can only be lively spaces when there is a diversity of scholars and students who interact with each other. However, there is something ‘colonial’ about arguments that completely ignore the fact that communities who lose their lands do not get much in return. ‘Colonial’ because giving up land can itself be extractive with guarantees of any returns being at best debatable. Perhaps, we need to be open to the possibility that the people of Loliem-Polem are not just fighting to save a lush, fertile piece of land.